Front fork leg Temporarily tighten the upper and lower bracket pinch bolts. 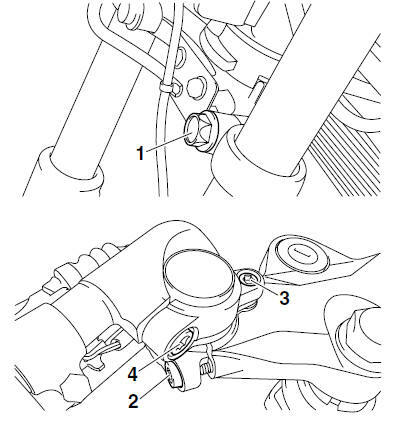 Make sure the inner tube end position "a" is 24.5 mm (0.96 in) from the top of the upper bracket. Lower bracket pinch bolt "1"
Upper bracket pinch bolt "2"
Make sure the brake hose, clutch cable, and leads are routed properly.